As a matter of fact, the Horsfield tortoise also is known as the Russian tortoise for sale is one of the smallest species of tortoises in the world. In comparison to other species of testudo tortoise, Russian tortoises for sale are small. Because of they’re compact size, Russian tortoises for sale are sold as pets across the united states. Additionally, fully mature Russian tortoises for sale only reach sizes of 5-6″ and females typically are 7-8. Most importantly, by nature, even baby Russian tortoise for sale are known for being are outgoing, not shy. Also, Russian tortoises for sale are reasonably easy to keep once well started and can make fantastic pet tortoises for young and old alike. Above all, at Tortoise Town, we have some absolutely stunning CAPTIVE BRED baby russian tortoise for sale. Because Russian tortoises for sale are a popular pet tortoise, Russian tortoises are one of the most readily available tortoise species. Because they are a small tortoise, baby Russian tortoises are easy for most people with limited space to keep. Secondly, Russian tortoises for sale are also feisty, eager to eat and more active than some other tortoises. In contrast to other testudo tortoise species, outdoor Russian tortoises for sale should be allowed to burrow. Because of Russians ability to burrow in the winter, these small tortoises for sale also have one of the highest tolerances for temperature extremes. Lastly, Russian tortoises are one of the few species that can be kept outdoors in most of the US year round. These factors make Russian tortoises attractive for new tortoise keepers and a fun tortoise for seasoned veterans. Most Russian tortoises for sale at pet stores, are adults, and are imported into the United States. For this reason, finding a captive bred Russian tortoise for sale is key. Expect them to be more expensive, as Russians only lay 1-3 eggs per clutch on average, so babies run anywhere from 225-400.00 each. Sure, you can certainly obtain a 46-year-old, wild-caught adult at the pet store, but is that what you are wanting in a new pet tortoise for sale? Consequently, when compared to the number of imported tortoises, captive production of this species is relatively low. Because of this, always assume that most adult or subadult Russian tortoises for sale are wild-caught (imported). Captive-bred babies are rarely raised to adult size and sold at the low prices that these imported Russian tortoises sell for. Fresh, clean, chlorine-free water should be available at all times. Daily soaks for 20 minutes in lukewarm shallow water are recommended for all baby tortoises and tortoise under 18 months of age. Some tortoises have a tendency to go to the bathroom in their water bowl, so expect to clean and disinfect this daily, if you soak them separately each morning, this reduces the frequency of them dirtying their own water dishes. Size – Indoor enclosure should be at least 36”x18”; outdoor enclosure should be at least 48”x48” with a secure screened cover to allow sunshine but provide protection; the walls should be high enough that the tortoise can’t escape and buried at least 12” into the ground, as Russian tortoises will dig but not too much. Our indoor enclosures are just about 4’x8′ per group of 5 adults. 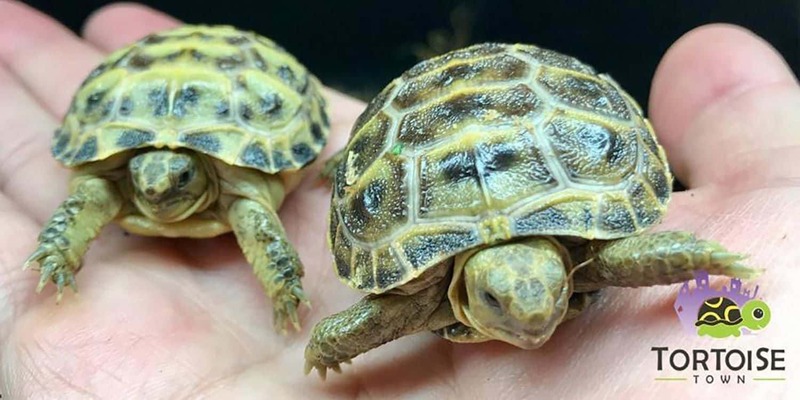 Russian tortoise for sale – Substrate – Tortoises are known for eating substrate, so use something that is digestible such as alfalfa pellets; substrate should be deep enough for the tortoise to burrow. Don’t use coarse substrates such as sand or gravel that can scratch the shell. Temperature – Temperature gradient (85°F for the warm end and 75°F for the cool end); recommend using an incandescent light or ceramic heater as a primary heat source. Russian tortoise for sale – Lighting – Providing UVB lighting for 12 to 14 hours a day is required. Because hatchlings need more humidity and moisture, soak them daily. In contrast, adults can do well with twice a week water soaks. Most importantly, ensure the water level is not deeper than the mid-point between the bottom of the tortoise’s shell and its top. We also have some slightly larger “well started” 6 month old baby russian tortoises for sale (highly recommended over russian tortoise hatchlings) that are a bit more active and “stronger” while still very small and cute. When choosing a Russian tortoise for sale, or a russian tortoise breeder, from a quality tortoise farm, be sure to only purchase captive bred babies, well-started babies, yearlings or adults. Russian tortoises for sale are also sometimes call the horsefield tortoise, horsefield tortoises for sale, or even the Russian turtle for sale. We’ve got even more than just Russian tortoises for sale! Shop our selection of Russian tortoises for sale and be sure to also check out our complete selection of tortoise supplies, tortoise uv light, tortoise food and other accessories. If you’re looking for a chameleon for sale, panther chameleon for sale, or even a gecko for sale, check out our sister site, CB reptile! Cb Reptile has a wide selection of captive bred reptiles for sale online including crested gecko for sale, leopard gecko for sale tortoise for sale and more. Other species of tortoise for sale offered here include giant tortoises like the Aldabra tortoise, Sulcata tortoise, Burmese mountain tortoise and more. Medium size species include the leopard tortoise, red-footed tortoise, yellow foot tortoise, mountain tortoise, Burmese star tortoise . .Also, the giant leopard tortoise. 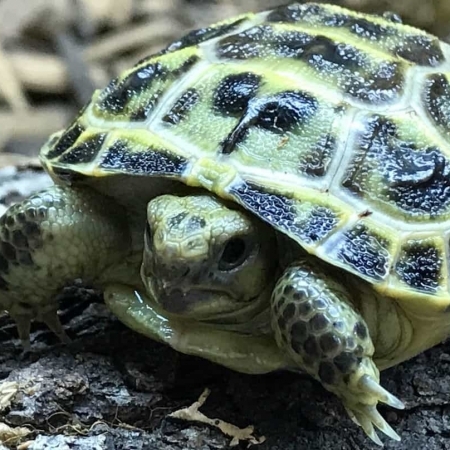 Small tortoise for sale includes Hermann’s tortoise, Greek Tortoise, Indian Star tortoise, Pancake Tortoise, Russian tortoise and the Egyptian tortoise. Above all, we’ve got the widest selection of tortoise for sale in the USA. This includes baby tortoise, juveniles and adult tortoises for sale. If you are considering other reptiles for sale, be sure to check out our sister website. Cb Reptile offers a great deal of captive bred reptiles for sale online. Some reptiles for sale include tortoise for sale as well as turtles for sale.